The Kansas lease agreements are legal documents that bind a landlord and tenant over the use of property for residential or commercial purposes. The contract will usually have a beginning and end date with the terms for how much the lessee is to pay on a monthly basis to the lessor. After the document has been signed by all parties they will be legally bound to perform and cannot terminate the agreement without consent from each other. Rental Application – To be used after a tenant becomes interested in renting space so the owner/agent may view their credentials such as credit, background, previous employers, and previous landlords. Association of Realtors Agreement – Provided by the Kansas Association of Realtors for standard residential tenancies. Commercial Lease Agreement – Primarily for business-oriented uses such as office, retail, and industrial spaces. Month to Month Lease Agreement (§ 58-2570) – Tenancy at will that allows lessor or lessee to terminate the contract with at least thirty (30) days’ notice from the next payment period. Rental Agreement with Option to Purchase (Lease to Own) – For the purpose of having a residential landlord-tenant arrangement with the option of having the right to buy the property within certain guidelines. Room Rental (Roommate) Agreement – A contract between the members of a household to organize cleaning, payment of bills, and any other rules or items to be established amongst the roommates. Standard Residential Lease Agreement – Common twelve (12) month arrangement. Sublease Agreement – To perform the act of subletting by which a tenant allows another person, the subtenant, to take over their space. 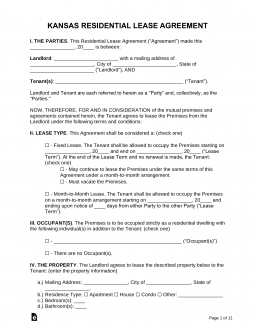 Termination Lease Letter (30-Day Notice) (§ 58-2570) – Gives notice of thirty (30) days to either the landlord or tenant that the tenancy in a month to month arrangement will be canceled. Authorized Persons (§ 58-2551) – Any authorized individuals and an address for notices to the landlord must be listed in the agreement and, if changed, must be updated. Lead-Based Paint – Federal law that requires any structure built prior to 1978 to be acknowledged by any new tenant through the disclosure form by their initials and signing on the bottom of the document. Move-in Checklist (§ 58-2548) – Within the first five (5) days of tenancy the landlord and tenant must conduct a walkthrough of the premises and itemized every pre-existing repair and blemish on the property. According to § 58-2557 the landlord shall have the right to enter the property with reasonable notice to the tenant and it must be during reasonable hours. Maximum (§ 58-2550) – One (1) month’s rent if the property is unfurnished and one and a half (1.5) months’ if it is furnished. Returning (§ 58-2550(b)) – The landlord must return the deposit within thirty (30) days from the date of lease termination. If there are any itemized deductions on behalf of the landlord they should be submitted to the tenant within fourteen (14) days.